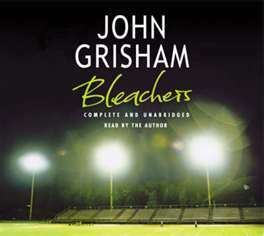 “Bleachers” by John Grisham. Scalp the ticket while you can. | brainsnorts inc.
“Bleachers” by John Grisham. Scalp the ticket while you can. There’s a commonly known formula, or at least it’s commonly known to me, that lies in almost every John Grisham novel. Either the government, a nationally feared law firm, or a conglomerate of a company is doing something wrong, usually doing it to regular people. Nobody can stop them, nobody except either a rookie lawyer or even “rookier” law student. The Pelican Brief, The Firm, The Associate, The Client, etc. Maybe I got one or two of those wrong, but there are others that can easily fill in. I look for Grisham novels that avoid this formula, but they’re not easy to find. The first book I ever read of his was A Time to Kill, a fabulous book. Also avoiding the formula that I have read are A Painted House ( pretty good), The Last Juror (also fabulous), The Broker (not fabulous), and Bleachers (far from fabulous). Bleachers centers on Eddie Rake, a dying high school football coach. He was a tough, no-nonsense field general who commanded his players to give more than everything to the team. Various players, some collegiate stars and some just stars in their own home, have gathered to pay respects, catch up on “who’s done what” since way back when, and relive the glory days that have faded along with their personal pride. Former players include a convict, a car thief, a Heisman hopeful, a bank executive, a sheriff, and a homosexual. These ex-players are about as stereotypical as you can expect. It’s the history of the Heisman hopeful that occupies most of the story, but it’s not really a story. There’s nothing hanging in the balance, nothing that drives us to wonder of the results or predict the outcome. There’s nobody I care about enough to want to know what he or she is going to do. It’s just a pile of reminiscences. Stress on pile. I’ve spent a lot of time on football fields, especially high school ones, and I’ve yet to see a movie or story of any kind get it right. There are hints about an incident that happened between the coach and his star quarterback Neely Crenshaw, the Heisman hopeful but has been. Crenshaw hasn’t spoken to the coach since his last game senior year in which something erupted at halftime when the Messina Spartans were uncharacteristically having their heads handed to them. After the halftime explosion in the locker room, the team took the field with no coaches. They stood away from the field and watched as Crenshaw guided the team to one of its greatest victories ever. And really, that’s about it. We eventually learn what happened at halftime, but it’s rather anticlimactic compared to everything else that has happened. There’s a reuniting of Crenshaw and Cameron, a former girlfriend, that is built up to be a long-lost lover reunion, but it fizzles into nothing and is rather poorly written to the point that I wanted them to just tell each other to get lost. Crenshaw tries to apologize for having cruelly dumped the girl during their junior year of school. She keeps telling him that it’s not a big deal, they were only kids. Yet, she punctuates the conversation with the fact that it took her ten years to forget about it. That’s not very consistent. Hey, Sister, make up your mind. If it was really not a big deal, then why did it take you ten years to get over him? Another problem was with the dialogue. Most of these characters are muscle heads, or they used to be, without much of an education. However, they toss a lot of big words around, phrasing sentences like a textbook instead of like someone who rarely brought home a textbook. Unfortunately, I listened to the book on CD, and I wasn’t able to play all the CD’s again in order to find examples of the poor dialogue. However, if you’d like an example of a writer paying a misguided, random homage to his hometown sports program, this is probably what you’re looking for. Did you ever read The Testament? I haven’t read many of his books, but I remember that one. It stayed with me for a long time. Not yet but now I’ll have to look into it. Thanks. I haven’t read very many of his books, and I read The Testament a long time ago…I always mean to read it again to see if I’ll like it just as much. If you read it, let me know what you think. I know my library has it in CD and I mainly do books that way. Thanks for suggestion. However, I would think that if you want to avoid the John Grisham formula, you would read, say, Stephen King. This is why it’s important to develop a broad range of interests, likes, and dislikes.